As it turns out, not every guitar is suited to play fingerstyle. We’ve given you the top 5 best fingersytle guitars so you know where to start, as well as some basics to get you going. While it is true that you can finger pick any guitar, you will want to play fingerstyle (otherwise know as “fingerpicking style”) on guitars that are suited for that type of playing. In a hurry? You can read my full article for all the details, but to cut to the chase, my top recommended option for most players is the Takamine GD20-NS Dreadnought available here. But, what exactly does it mean to play fingerstyle? Playing fingerstyle is a style of playing guitar that can be applied to all genres of music. Fingerstyle is when a player plucks the strings using their fingers (or fingernails), rather than using a pick. Fingerstyle playing used to be heavily used in folk style playing, but it has now reached across all musical genres- including rock. Fingerstyle picking can range from a very simple folk-style, also known as “Travis picking”, all the way to incredibly difficult and complex styles. There are several different names that fingerstyle is called in the music world, such as fingerpicking, pattering picking, etc. In fingerstyle playing, you are only allowed to play on a classical guitar; however, you can play fingerstyle in any genre of music. You can find fingerstyle playing in many different genres of music, including Celtic, blues, jazz, classical, rock, and many more. Fingerstyle playing allows players to perform multiple parts at once; for example, a bass line, accompaniment, and melody, all at once. What is a fingerstyle guitar? A fingerstyle guitar is a guitar that has a lighter construction in comparison to a guitar designed for bluegrass, rock, or other genres of music. 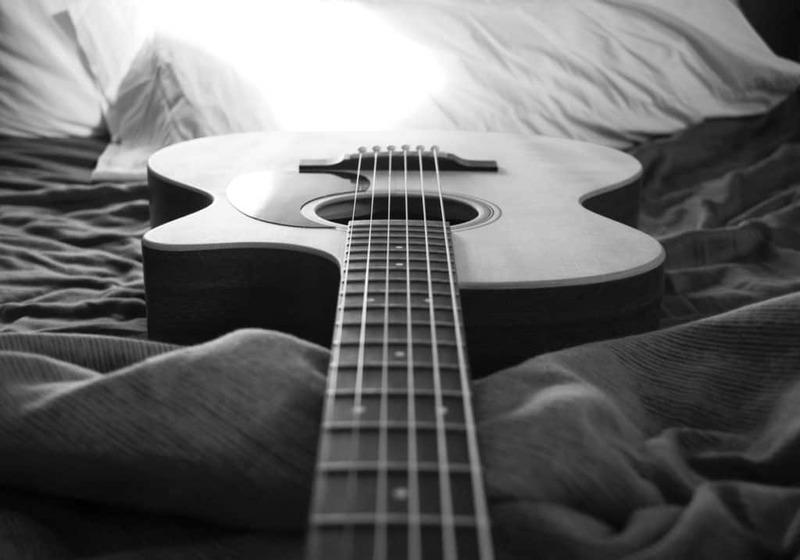 The reason why fingerstyles guitars are constructed to be lighter is because the player needs less energy to produce sound using the fingers, in comparison to playing with a pick. This means that the fingerstyle guitar has to be dramatically more responsive with a lighter touch. It is very popular for fingerstyle guitars to feature wider string spacing; the string spacing can be as wide as 59mm, but the average us 57mm, which is 4mm that your basic acoustic guitar. This extra spacing allows extra room for your fingers to move around and you not have to worry about hitting another string; the extra spacing comes in handy when playing arpeggios. The nut width on the average fingerstyle guitar is 1 11/16 inches (43mm) in comparison to the 1 ¾ inches (45mm) on the average guitar. It’s very easy to become overwhelmed by all of the choices of guitars that you can choose from while going shopping for your dream guitar. If you are a beginner, you are more than likely to get confused about all of the different speculations and information that manufacturers provide shoppers with. There are a countless number of guitars that are available on the market, in every single style that this world has to offer. But, how do you know how to evaluate the quality of a guitar if you’re not sure how to tell the difference between different details that each guitar has? That’s why we’ve created this guide to help you decide between all of the guitar choices out there! The Takamine GD20-NS Dreadnought Natural Acoustic is often referred to as the ‘dirt-cheap luxury’. Why? The GD20-NS is affordable for all level players, beginning included; on top of that, it plays like a guitar that’s worth thousands of dollars. If you are a player who is looking for a guitar that produces a different sound, check out the Takamine GD20-NS! The unique combination of solid mahogany and solid cedar ensures that this guitar produces a warmer sound. This guitar is perfect entry-level musicians, due to the slim neck that’s sported on this guitar. GD20-NS is easy to play, which makes it perfect for beginning guitarists. Due to the slim shape of the neck, your hand won’t feel fatigued as quickly, in comparison to playing on a traditional size neck. The size of the neck also allows players to play more comfortably, which helps to allow players to play at a faster tempo. If you are looking for a professional sounding guitar, but afraid the dreadnought style size will affect how well you play, I would suggest this guitar to you. Also, the pin-less bridge makes changing strings on this guitar a breeze! You won’t have to worry about losing your pins or breaking them while you’re changing out your strings. The GD20-NS is also popular among singers, produces, and songwriters of all musical genres (as the sound quality from this guitar is so pure, it doesn’t fit exactly into one genre). 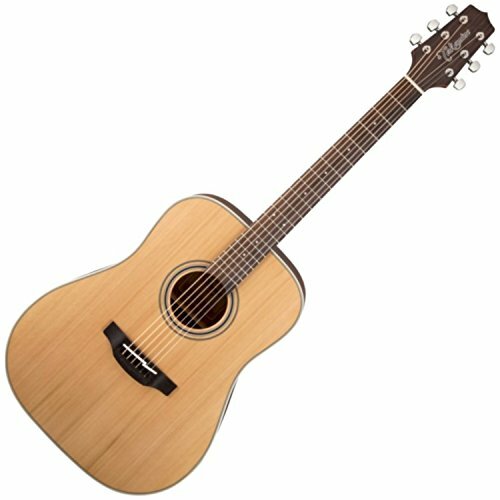 The Takamine GD20-NS Dreadnought Natural Acoustic is a high-quality guitar that’s offered at an affordable price. If you are looking for a guitar that plays like a million bucks, but aren’t willing to shell out a million bucks, this is the perfect investment for you to make. While it is easy to play, the GD20-NS also provides players with a unique, rich, and full sound. The price may make you think otherwise, but the GD20-NS does not sound like a cheap guitar; the warm and inviting tone that comes from this guitar is a favorite among may professional musicians. However, if you just plan on learning for yourself, all you will need is a soft case (also called a gig bag) to store all of your supplies and your guitar. Takamine is a brand that’s known for having irresistible guitars; their GD20-NS is not any different. The GD20-NS is a pure guitar that offers premium features for beginning players, sturdiness for intermediate players, and significant tone perfection for professional players and musicians. The total output of this guitar, tonal quality, simple and elegant appearance and cosmetics of the GD20-NS make it worth several thousand dollars, but instead, it’s on the market for only a few hundred! Martin’s GPCPA5K Performing Artist Series Acoustic Guitar is well known for producing warm and balanced sound, as well as having sound that’s easy to control. Martin is known for producing quality guitars that last for decades and this is a guitar that will surely produce consistent and quality sound. Solid Spruce: The GPCPA5K’s body is made from solid Sitka spruce top, which ensures that the guitar has a balanced and vast tonal projection. 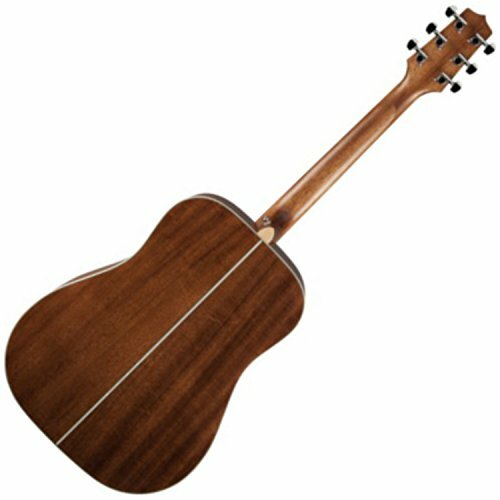 If you a person who has small hands, or you are just a smaller person in general, the Martin GPCPA5K Performing Artist Acoustic Guitar is a great guitar for you; the grand performance build of this guitar is slightly smaller in comparison to a classic dreadnought. This guitar is great for live performances, specifically in folk, jazz, and blues. If you do happen to be somebody who is interested in live performing specifically, the build of this guitar makes it the perfect for live stage performance. The GPCPA5K is also known to be a guitar that is easy to control the sound coming from the guitar, as well as being a guitar that delivers loud and clear tones, with a large dynamic contrast. While the Martin GPCPA5K is an expensive guitar, out of the rest of the guitars that Martin produces, the GPCPA5K could be considered relatively affordable. After all, Martin’s guitars are known to be some of the best acoustic guitars that are available on today’s market! 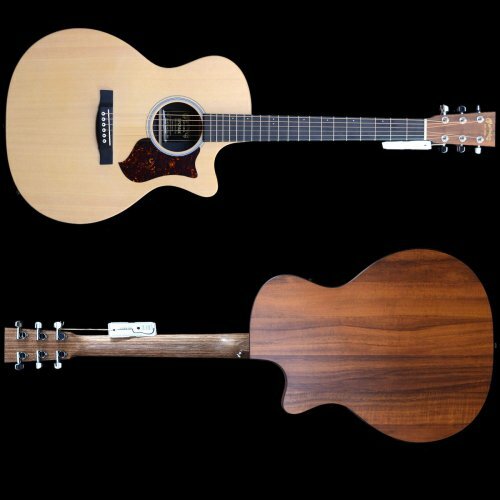 The body of the Martin GPCPA5K Performing Artist Acoustic Guitar is slightly smaller than the average dreadnought body; the slim taper neck displays a Black Richlite fingerboard. The fingerboard sports traditional dot inlays help to ensure that the fretboard will feel more comfortable in your hand, even after a long time of playing. While the smaller size of the neck and body may scare off some people, this Marting guitar still delivers large and rich tones. 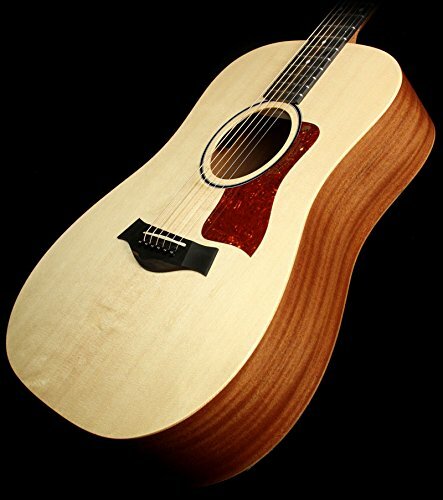 While the legacy of Fender’s guitars are known world wide, the Fender CD-60 Dreadnought Acoustic Electricis described to be a guitar that has concert level sound projection, consistent tonality, and a high-quality build. Whether you are a beginning guitarist, or just someone who is just looking to add to their travel collection, and you are looking to make a good investment, the Fender CD-60 offers a medium-quality instrument for a value that isn’t too pricey. 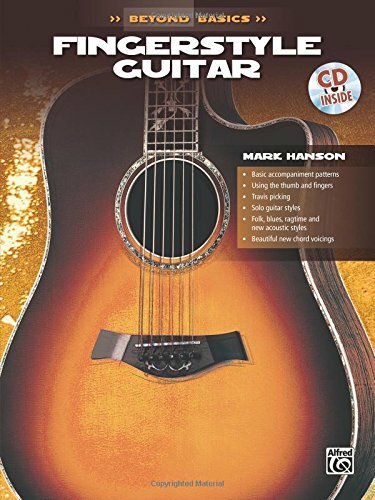 If you are a beginner and you are just looking for a basic acoustic-electric guitar, this is most definitely suitable for you. The CD-60 is also said to maintain a consistent sound while played in different settings, while producing enough sound to satisfy both beginning and intermediate players. This guitar does a fairly good job producing a deep and moderately rich tone while strummed. Fender claims that the CD-60 is suited for a beginning guitarist, as well as people who like to travel with their guitar and are looking for an affordable, yet high-quality instrument to add to their collection. Maybe you are just looking for a guitar that can travel with you and you are not worried too much about the quality sound coming from your guitar, I would also suggest this instrument to you. There are three choices to choose from when deciding on the physical appearance of your guitar; black, sunburst, or natural. While the CD-60 isn’t going to replace Martin’s Taylor, this guitar will certainly be a wonderful first guitar, or a back-up guitar to take with you while you are on the road. Plus, you won’t have to shell out thousands of dollars in order to have a professional quality instrument that will grow with you as you become a better player! The Fender CD-60 Acoustic Guitar’s attention grabbing design and superb sound demands it to be played. The Taylor Big Baby work great as a lead acoustic guitar, due to the bright sound; the Taylor Big Baby works great for live performances, people who want to play just for personal satisfaction, or people who are looking to perform in a studio. Taylor Big Baby is an affordable, smaller sized dreadnought, but plays like a full-sized dreadnought at a minimal price! Despite having a smaller body than the regular dreadnought guitar, the Taylor Big Baby packs a full sound, with an incredibly sound projection. While they are called Big Baby guitars for a reason, the Taylor Big Baby doesn’t feel like a small guitar while you’re playing it; it’s a resonant, light, and very durable guitar. 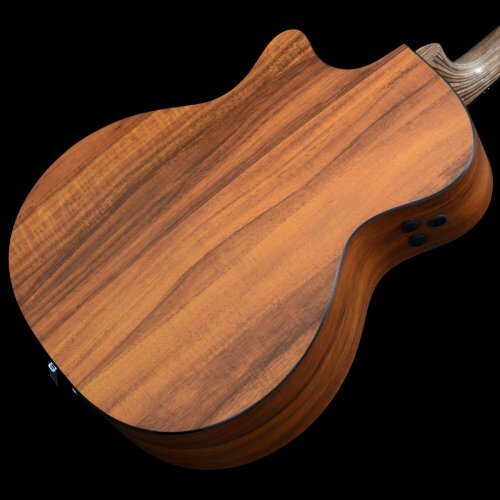 If you are worried about the feel of the guitar, the finish that Taylor put on their Big Baby it easy on the skin; it doesn’t cause irritation and doesn’t wear off, even after years of playing. The Baby Taylor is a light, bright, and articulated model that is easy to play fingerpicking on. Big Baby Taylor responds well to all types of percussion, but especially well picking and strumming. Taylor says that their Big Baby is great to travel with, because of the reduction in size, but will put on a professional performance just as well as any guitar that costs several thousand dollars. The Taylor Big Baby is a basic and simple guitar; it’s a quality choice in a guitar if you’re looking to only have a moderately priced spending trip. If you are someone who travels a lot, the Big Baby would be perfect for you. The Big Baby is an affordable starting option for beginners, but a great travel companion for seasoned players; it’s just shy of being a full-sized guitar, which makes it a lot easier to travel with. Despite having a smaller body than the regular dreadnought guitar, the Taylor Big Baby packs a full sound, with an incredible sound projection. Washburn claims that the WD7S is unmatchable at its price range due to the tone, quality, sound projection, and unique guitar features that the WD7S offers. This is a guitar that will grow with you; if you are serious about playing, you will only have to make the investment in a quality guitar once. The Washburn WD7S Harvest Series Dreadnought Acoustic guitar is known for delivering professional sound at a beginner’s price. If you are looking for an acoustic guitar that is going to produce clear tones for decades to come, the WD7S is going to be your pick. Whether you are a beginning guitarist or just someone who is looking to add to their collection, I would most definitely suggest making the $200 investment and adding this beauty into your life. As Washburn described, the WD7S truly is a guitar that will grow with you are your skill level advances. Washburn WD7S Harvest Series Grand Auditorium Acoustic Guitar - Tobacco Sunburst. While the dreadnought body style may make you think that the WD7S will become uncomfortable to hold after a long period of time, the construction of the neck offers lightweight and comfortable playing. Whether you are looking to perform in a one-on-one setting or in a live audience, the WD7S does deliver crystal clear, powerful, and full sound for your favorite chords. The dreadnought body shape ensures that there is a wide selection of tones that can be produced, as well as excellent sound projection. The WD7S is known for its high-quality sound projection, but also for being able to keep a solid sound integrity. Washburn ensures that their WD7S is able to produce loud, sharp, and clear tones while strummed; on the other hand, if the WD7S steel stings are fingerpicked, the instrument produces a mellow, soft, and sweet tone. the WD7S will be certain to show you the quality workmanship of the guitar through its sounds and tones. Steel String Guitars vs Nylon String Guitars: While you are looking at different fingerstyle guitars, you will see two main types of strings that these types of guitars are strung with: that is the nylon string and the steel string. If you are looking at a guitar that has steel strings (steel-string acoustic), but want to have a guitar strung with nylon, go purchase a pack of nylon strings and re-string your guitar! That way you won’t have to go purchase a whole new guitar! Guitarists who play fingerstyle usually use stings that have a lighter gauge in comparison to guitar players who strum. While it’s okay to use a heavier gauge string, you may find that trying to play certain techniques to be more difficult. 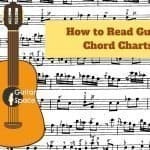 If you are just getting started in learning how to play fingerstyle, you may want to start out with a light gauge of strings, just to see how they feel for you. If you are a beginning guitarist, new to learning how to play fingerstyle, or have smaller hands, I would suggest using a lighter gauge string. 012-054 happens to be the most commonly used gauge for fingerstyle guitar strings. If you don’t enjoy the feeling or the light gauge strings, you can always re-string your guitar with extra light gauge strings or medium gauge strings. Another option for fingerstyle players to use is to purchase a mix of extra light gauge, light gauge, and medium gauge strings and customize their guitar, by applying different gauges to each string. Experiment and see what works best for you! Maybe read a book or two if you’d like! Every single guitarist is different, to make sure that you experiment with all of the different options that are available. If you have the opportunity, try going to a local guitar (or music) store and play the guitars that you are interested. Make sure that you ask any questions that you have, because you want to make sure that the guitar you pick is perfect for you! No matter what guitar fits you budget, whether you are a beginner or an advanced musician, what materials you desire to have your guitar made from, or what you want your guitar to sound like, there is a fingerstyle guitar out there for you! 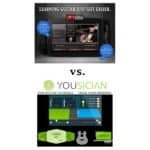 Yousician vs. Jam Play Online Lesson Comparison: Which One Would You Love More? “In fingerstyle playing, you are only allowed to play on a classical guitar” Bulls**t. Chet Atkins, who you may know is the God of fingerstyle, played on steelstrings. Not classical. Most fingerstyle players play on steel acoustics not classicals. Fewer play on classicals. I’m pretty sure your numbers are reversed. 1 3/4 = 1 12/16 vs 1 11/16.